Since buying our Romilly in 2010 I have read with interest various articles on this website regarding ‘Heavy Weather Sailing’. One of these makes the point that Romilly is Design Category D – Sheltered Inshore Waters. Wind up to F4 & significant waves up to 0.3m. My most recent sail was considerably beyond this range, & so I thought the experience may be of interest to others. We spent most of our long weekend cruising up to Tobermory on the Island of Mull and around the creeks & islands of Loch Sunart. 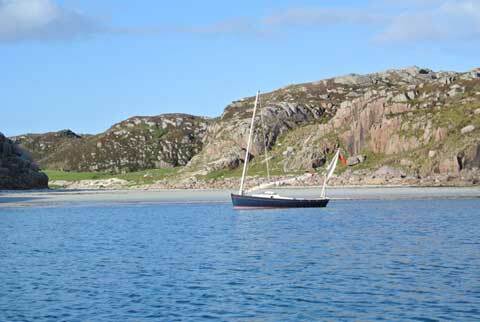 The attached picture is of us sailing up this lovely loch, where we anchored within 100ft of 15 seals basking on the rocks. 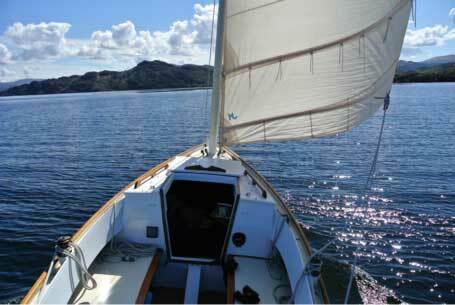 At the end of the weekend we sailed South down the Sound of Mull towards our mooring on Loch Linnhe. We had a very enjoyable sail, beam & broad reaching in F3 to F5 and clocking some good speed – the best was just over 9 knots. We could see white horses ahead in Loch Linnhe & put in the second reef before going on the wind to start the 10 mile beat back to our mooring. The wind increased quickly, & after sailing to windward for about 4 miles we decided to opt for the security of Oban harbour which involved a very broad reach to the bottom of Lismore Island and a fine reach to the harbour entrance. It was only after we went ashore that we learned the wind was 35-40 knots – a comfortable F8! In addition, conditions were wind against tide, & I estimate the waves to be short and at least 4ft in height. I think everyone would agree that the conditions were comfortably , if that’s the right word, above Design Category D! So how did it go? Well we appeared to make really good progress to windward, going through the water at 4.5 to 5.5 knots and never being stopped by the short steep waves. I think a small modern cruiser would have slammed into these waves and stopped dead on occasion. As we didn’t tack I couldn’t say what angle we were making. It felt like about 45 degrees to the wind, which seemed remarkably good, but of course the tide would have helped considerably. The boat stayed remarkably dry. A couple of times we shipped a some water over the leeward gunwale due to too much heel (poor helming!) and inevitably there was spray coming over the windward side but I don’t remember shipping anything green over the bow & into the cockpit. We chose not to sheet the main bar-tight and we sheeted the mizzen fairly loose. We cleated off the main to windward, & adjusted the mizzen in the gusts. Our angle to the wind changed noticeably as we sailed over the waves & I think tightly sheeted sails would have powered up too quickly. She sailed to windward a bit like a single handed dinghy in a strong breeze, with most of the drive coming from the leech of the main, & a little from the leech of the mizzen. The tiller was quite light going to windward, provided the mizzen was not tight, and my sense was that the mizzen helped to maintain a suitable angle to the wind. Off the wind, on a very broad reach, she threatened to round up on a few occasions. The mizzen should not have been up at this point, and once it was safe to do so we took it down which was a great improvement. In summary, the boat did really well. It gives confidence in the design & strength of the boat & rig to be able to go to windward in pretty extreme conditions when you get caught out (the forecast said 20-25 knots so it seems fair to say we were caught out). However, the sailing was pretty wet and demanded concentration and I would not want to do it for very long. The normal factors of safety which we enjoy when out on the water felt significantly reduced. I am building an Australian lightweight sharpie – cruising version, 20’6“x6’7”, and would like to rig it like Romilly. The existing sail design is typical Bermudan sloop. Can you suggest some sources of information, for design and placement of masts, sail areas?